Today, it's a must-do speech, so much so that it was lampooned this week by The Onion--but it turns out that the "wifely testimonial" is a recent addition to political conventions, pioneered by Barbara Bush at the 1992 Republican National Convention. 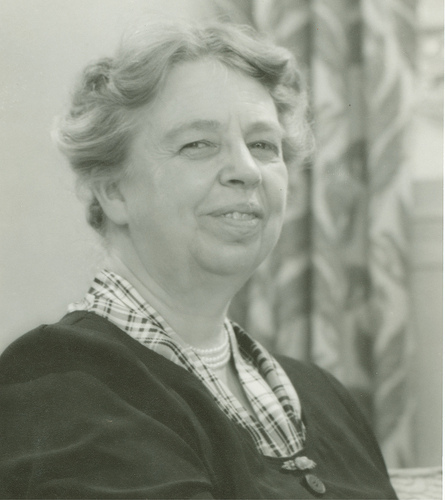 Major speaking roles for the candidate's wife were non-existent at the conventions until then--except for one dramatic, last-minute, save-the-day speech given by Eleanor Roosevelt at the 1940 Democratic National Convention in Chicago. You cannot treat it as you would treat an ordinary nomination in an ordinary time. We people in the United States have got to realize today that we face a grave and serious situation. Therefore, this year the candidate who is the President of the United States cannot make a campaign in the usual sense of the word. He must be on his job. Eleanor had long played a role as FDR's eyes, ears and presence as an emissary in public appearances he could not manage with his disability, giving frequent speeches. But none had as direct and dramatic effect as this impromptu assignment. 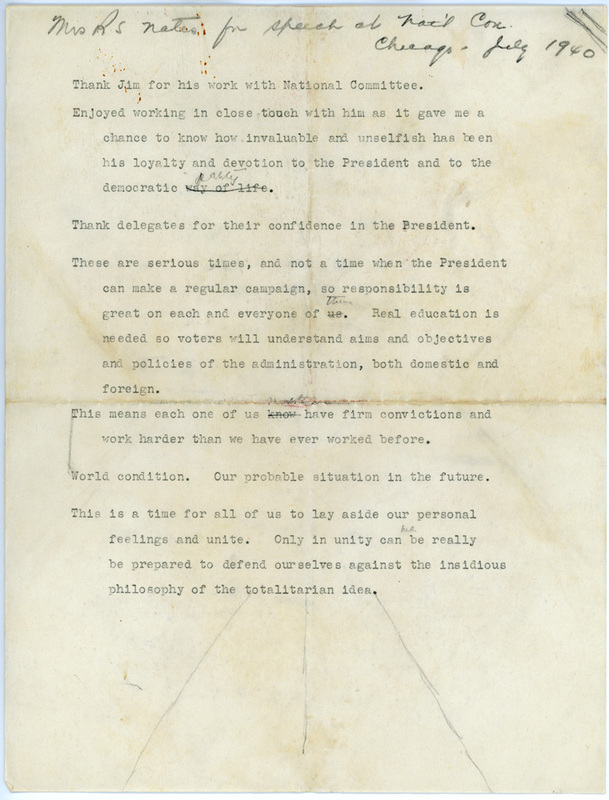 This post on the speech from the FDR Library notes, "The effect of her words was transformative. A silence marked by respect and admiration followed her message, somberly and palpably shifting the atmosphere. Balloting began immediately after she sat down and the Convention went on to nominate Henry A. Wallace to run alongside Franklin D. Roosevelt in the 1940 election." Focus on your call to action: Those of us who advise speakers talk about the call to action, but it comes into sharp focus at an event like this one. Roosevelt had just one purpose, to stay the revolt and turn it toward voting the nominees forward. So she kept her remarks single-minded, and they worked, ending with "No man who is a candidate or who is President can carry this situation alone," and the important task before the convention. Respect the roles and speak for yourself: Roosevelt mentions just three people specifically in her remarks, honoring and delineating their roles. She thanks the party chairman in almost a full paragraph at the outset. She makes clear she is not speaking for the President, saying "I cannot possibly bring you a message from the President because he will give you his own message," in words that make it clear she is not usurping authority, but speaking for herself. And she reminds the listeners of the role of the President at an uncertain time. Reflect the tension: Rather than shy away from the tension, Roosevelt reflected it back so the delegates knew she understood the situation of the day and its difficulties. She talks about the uncertainty of the convention, and ties it to the uncertainty of the nation and the world, and uses those tensions to make the case for action. 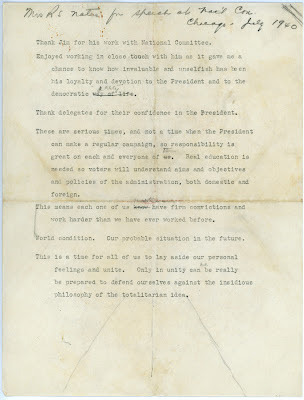 With almost no time to craft and polish a speech, Eleanor Roosevelt gave her remarks with just a single page of notes, shown here in a photo from the FDR Library. As you can see, the words "This is no ordinary time," perhaps the most quoted, don't appear in the notes. Read her notes, then read the full remarks--which are much longer--here. What do you think of this famous speech? Two big takeaways from this article. 1-Focus on your call to action. In a persuasive speech, you need to be specific about what you want your audience to do. It's not insulting to say "vote for me, sign here, call this number" or whatever. You can't assume the listener is going to do it or do it in a timely manner. 2-Less is more when it comes to writing out a speaking outline. The more you write, the more likely you feel married to your words and will read, rather than naturally present. Eleanor proved it.